Aggregation Temperature - What is it, and how can we calculate it? Aggregation Temperature (Tagg) – what is it, and how can we calculate it? In dynamic light scattering (DLS), the hydrodynamic size and size distribution of particles in solution can be obtained. It may be of interest to examine this measurement as a function of time and temperature, or as a ‘trend’, as it is called in the Malvern Zetasizer software. For biological protein samples, this temperature trend is particularly interesting: although at low temperatures a protein may be stable and show repeatable size (and scattering intensity) measurements, typically at some elevated temperature (Tagg), protein molecules will show a tendency to oligomerize or aggregate. The temperature at which this occurs will depend on the protein itself, plus the buffer composition, and it is usually only observed clearly when the starting protein is homogeneous at the beginning of the measurement. An example, discussing the stability of recombinant human albumin, is discussed in the application note, “Using light scattering to study the thermal stability of Recombumin – predicting shelf life“. The multi-parameter fit takes into consideration both the change in hydrodynamic (z-average) size and (derived) scattering count rate and is the preferred method. A screenshot from the current software shows a typical difference between the two analysis methods. As an example for the hemoglobin aggregation provided in the Example Results.dts file, the old single-parameter method gave a result of 38ºC, whereas the new multi-parameter method gave a result of 42ºC. The absolute change is not too much of a concern, as long as the same method is using when comparing different data sets. To see this menu for any data set, highlight a record, right-click and select edit result. Why is Tagg different from Tmelt? The aggregation temperature detects the onset of aggregation; the temperature at which molecules have a tendency to aggregate together. The melting temperature, Tmelt or Tm, on the other hand, is the result of (almost) complete denaturation of the protein. It can, for example, be determined by differential scanning calorimetry (DSC) or with circular dichroism (CD), which can respectively detect small changes in thermal capacity and overall structure. 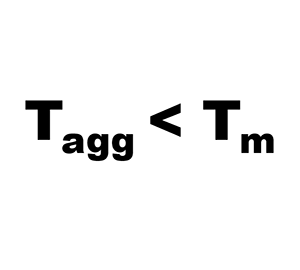 Due to the extreme sensitivity of light scattering to small molecular size changes and the onset of oligomerization, the aggregation temperature (Tagg) is typically seen to be lower than the melting temperature (Tmelt). How to setup a measurement for Tagg ? The Zetasizer allows automated trend measurements versus temperature. To access the menu, either start a manual measurement, or create an SOP. Then select in the upper left corner of the window Measurement Type – Trend – Temperature – Size which will start with some default settings. Go through the menu items, in particular the trend sequence, where start and end temperature as well as temperature interval can be entered. Place a checkmark next to “check for aggregation point”. Under the “Size measurement” settings, provide the equilibration time at each step. I recommend to place a checkmark next to “allow results to be saved containing correlation data only” . This will even save data when the sample is quite aggregated (i.e. beyond the aggregation temperature) and can be useful to have. The SOP estimates the experiment length and this is displayed in the trend and the Size measurement sections (it may require clicking on something else to update the calculation). The SOP or manual measurement can then be started just like a regular measurement.